We get some great testimonials and they help us greatly in letting us know how we are doing. Each and every one of us here at Rose Blossom Cottage benefits from your comments, so if you have one, please don't hesitate to contact us. Recently I order an adorable lady bug charm and some other items from Rose Blossom Cottage. The package arrived and it certainly stood out from other deliveries! Starting with the pretty picture of roses on the outside and then the carefully tissue-wrapped items sporting pink bows! What a nice treat! Also, how generous and thoughtful of you to send that pretty silver chain for the lady bug charm ~ it will make the perfect gift for my niece ~ thank you very much! My daughter loves anything "French" so the cute Fifi Angels towel will be part of her birthday gift. Your "extra touches" really make shopping a pleasure and brighten a Connecticut Winter Day! I am very happy with Adora! Since receiving the bracelet on Monday I have worn it every day. I also enjoyed all the little extras with the packaging! Thanks so much for your wonderful, unique work! I didn't think it was possible for me to love my new bracelet more than my rose necklace/bracelet previously purchased...but I DO!!! It's my wedding colors and I've always been drawn to French blues and yellows! I'll never take it off! Thank y'all for taking such care in all the details like earrings, pretty papers, sweet notes and mints:) Yall are...Amazing! purchase that I'd originally seen in Victoria Magazine. I'm a long time subscriber and love all things of that time period. Additionally, I'm originally from Tyler, Texas - rose capital of the world and so this piece is extra special. The Rose Festival is in the fall in Tyler. I may not be able to resist another piece. I just wanted to send you a little note to express my excitement...I opened up this morning's RBC email and was reading along. Of course I was totally curious when I got to the part about some of the new pieces selling out within a couple hours of hitting the site, so I scrolled right on down to the bottom to see what all the hoopla was about! And there, jumping right out at me, was the photo of the knife-handle necklaces, my mom's wedding silver pattern one of the three pictured, I was almost positive! It took me a couple heart-stopping minutes to get to the correct, specific listing, but YES, that was it!!! (It's called Coronation and apparently was released in 1936 to commemorate the coronation of King Edward...which never took place since he abdicated the throne for love of Wallis Simpson). Boom! Right into the cart went THAT piece!! My parents were married March 8, 1947, so they would have celebrated their 68th anniversary on Sunday...and now I will own a little piece of art to wear as a reminder of them and their special day! I am so tickled to have found this! My compliments on your cleverness and originality in your work...I've admired it for some time now but this is the first order I've actually placed. And I'm sure there will be more to come; I think I've found a new go-to for heartfelt or sentimental gifts for my loved ones...and hey, who's to say there won't be more occasions to treat yours truly?!?! done and thank you so very much. I will take great pleasure in giving it to her and also keeping a look out on your gorgeous website. I had no problem to download the pictures and I had them printed at Walmart. They came out beautiful. The colors are crisp. I have not framed them yet. I am getting ready to decorate a shabby chic room and they will be displayed on my wall. Thank you so much for following up. I am very impressed. The necklace is lovely; your packaging and delivery are superb. I have never seen such a lovely composition of wrapping and treats. It is like shopping at a side lane French boutique. Thanks for the treat! I love opening your packages. They remind me of my Grandmother who always packed little goodies around the packages she sent from Maine. The ornaments are beautiful as always. Thank you. ~Peggy B.
I love it!!! ~Flora G.
Dear Kim --- I just opened my package from you and was so delighted with the prints! Tell April she packed them just great and they arrived as beautifully as they were pictured on your site. Thank you, too, for the extra prints and even the little notes were just precious --- I'll keep them here at my desk --- even the little note of 'thanks for recycling' was darling, as I do try to re-use, re-cycle and re-purpose at every chance I can --- my Mom used to say, ---"Use it up - Wear it out - Make it do or do without!" Now I have to admit that I don't always 'do without' if I'm determined to find or make what I need to decorate our home, but I do 'use up and wear out' most everything! I even saved that lovely Byron quote from the back of my package, as it somehow arrived to me unmarred thru the mail! I know just the Friend I'll frame it and gift it to! Many Thanks and I'll be checking back often! ~Deborah S.
Your work is wonderful, and I know I will be visiting your store often. loyal customer in me, and I thank you. OMG! I got the bracelet and necklace yesterday and they are absolutely gorgeous! I love them both. Thank you so much. The Antique Roses plaque is also beautiful. Everything I have ever gotton from you has more than met my expectations. You do such great work. My friend received her "lucky Dime"
and she will actually be ordering some more from you. What a wonderful example of truly exceptional customer service! I loved the hand painted chest! I will most definitely send you a photo of it when I've decorated it, and of my Vintage Wedding too! Thank you for being so charming. Thanks also for the beautiful tablet & pen which goes great with my antique desk. The candy was adorable! (I think I'll save it for awhile). ;)I'm young but love old fashioned service! Most of all I love all things vintage. I'm so glad you put TX on the map as far as antique shops go. I don't know very many people here that appreciate our love for the finer-shabbier chic things! 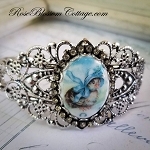 I am very impressed with RoseBlossomCottage.com. I recently subscribed to Mary Engelbreit's magazine....Home Companion, and found your site in the magazine. I love antiques and all things "old." So the vintage glass earrings and button charm caught my eye. I received the package with my order Saturday the 16th and everything arrived in perfect condition. I was impressed how quickly you filled my order. I am also impressed with the quality of the pieces I received. You have an ace silversmith. Everything is in such excellent taste. I also like to do business with people who use the United Sates Postal Service......I really don't care for UPS and it's service. Last of all, I thank you for giving me the magnetic memo pad and pen. Again, everything in such excellent taste. So I am very pleased with your website and will be ordering again. I'm in the process of doing my Christmas shopping now. I like to be finished with my shopping by late October or early November. It saves me from being out with the hordes of shoppers in December. It's the only smart thing I do all year. I'm happy I found you. I received my pieces yesterday, and I have to say they are simply beautiful! Thank you so much! I can't wait to wear them and show them off! You can be sure I will be a frequent visitor to your site. Hi! I just love the china remnant earrings that I ordered from you. They are just gorgeous! Have a happy 4th! Yours truly, Kim L.
I just wanted to let you know that my recent order arrived and, as always, it's even nicer in person than on your website. I also wanted to thank you for the generous extras, especially the magnetic clasp---which I will definitely use. Thanks again, Karen A. Thank you very much for such fast service. I love the necklace! It is beautiful. I am an antique dealer and dearly love the "old stuff." I am also very impressed with how you package the necklace. What a nice touch to get candy, a bag to hold the necklace, and a pen. Very impressive! I received the charms in good order. They are wonderful. I'm deciding which one to wear today! Thanks for the pen. It's hanging out with the paper from my last order. My son (19) was absolutely amazed that I got a "personalized" e-mail from you (he was looking over my shoulder the other day), then asked why I had ordered a pen when I opened my last order. I showed him the paper, he shook his head, and then I asked him if he was sorry he wasn't a girl. Then I gave him a mint. Thanks for the great service and beautiful items. I, also, love the Teena Flanner figurines, found them while I was living in Pennsylvania. I have a collection for Easter, Christmas and snowmen ( who come out after the Santas are packed away. I'll keep checking your site. Thanks, Dawn B.
Dear Rose Blossom Cottage - I got my earrings and love them. 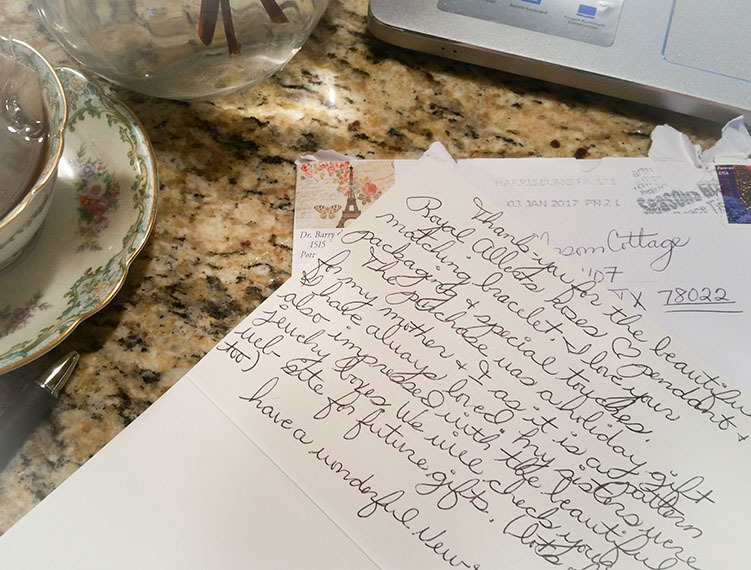 I really appreciated your personal touch with the handwritten note and gift. Thank you and I'll be back. Oh my heck. This came today. It is absolutely stunning!!!!!!!!!!!!!! Now I want one!!! Maybe I can talk hubby into getting me one. Oh you have such a talent. I only have 1 problem. The way you wrapped it with the gorgeous pen? Well it looks so pretty but I want the pen. LOL. I think I will put it back on there just because it looked gorgeous wrapped up that way. Thank you so much. I am sure I will be back. You have a definite talent there!!!!!!!!!!!!! P.S. Thank you for the shipping refunds!! EXTRA PIECE AND YOUR COUPON. YOUR APPLIQUES STYLES ARE UNIQUE AND LOVELY. YOU HAVE A BEAUTIFUL WEB SITE AND I LOOK FORWARD TO LOGGING ON AND SEEING YOUR CREATIONS. CONGRATULATIONS AND THANK YOU FOR YOUR GREAT PRODUCTS. LOTS OF SUCCESS TO YOU!!!!!!! mini hearts and a bracelet to attach them to.